Perhaps you have just brought your first house and you want to redo the garden or you feel as though your current garden could do with a bit of a spruce up. Often people may forget about the wonders that a great wall could do for your garden. A wall however can change the whole atmosphere of your garden and done correctly can achieve the look that you are going for to complete your garden. We here at RMS Building Services will be able to offer you any help and advice that you might need. We do all types of brickwork! One of the first things that you have to think about is how you want the wall to look once it is complete and the finished product depends entirely on the type of brick that you pick, or material that you choose to be shown on the external part of the wall. On the interior it is normally finished with the use of thermal or concrete blocks. We offer our customers a whole array of different colours and textures to choose from. We have both machine made and handmade special bricks, our staff are highly trained and can help you make the right decision. In many gardens, the provision of some type of walling is essential. If you want a water feature, to divide up a garden, retain soil or for it to be used for privacy and security a retaining wall would be a fantastic option. There are many types of materials that can be used to create retaining walls like concrete blocks, poured concrete, treated timbers, rocks or boulders. Some are easy to use, others have a shorter life span, but all can retain soil. We can offer a range of walling options to satisfy the look you wish to achieve. We will be able to give you traditional masonry such as Bricklaying Nottingham and blockwork, manufactured garden feature walling, dry stone walling and much more. 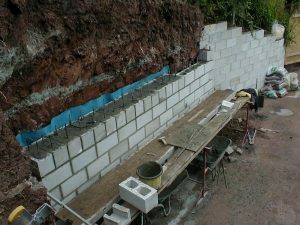 Blockwork is structure with concrete or cement blocks that are bigger than a standard clay or concrete brick. To make them lighter and easier to work with they have a hollow core that also improves their insulation capacity. They are available in a variety of densities to suit different applications. Their convenience and low costing, which has made them a popular substitute to clay bricks although they require an additional finish for reasons of aesthetics and water resistance. They are often used to build retaining walls. 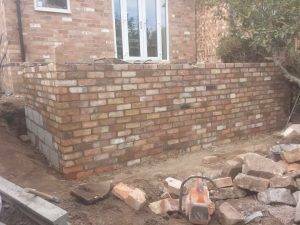 Bricklaying Nottingham.